Kicking off the biggest weekend in WMMA history, Invicta FC 11 took place at the Shrine Expo Hall in Los Angeles Friday night. In a night of exciting fights—many of which ended in the first round—a new generation of mixed martial artists including Aspen Ladd, Irene Aldana, and Alexa Grasso proved that the future is almost here with a definite series of victories. 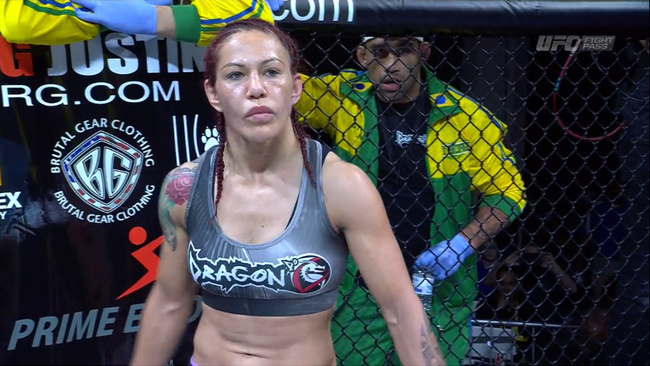 At the end of the night, though, polarizing MMA veteran Cristiane ‘Cyborg’ Justino returned to the cage for the first time in eighteen months and proved that she is still the dominating past and present of the sport. And hinted, again, that Ronda Rousey might still be in her future. 1. As I sit here and stare at the main Cyborg vs. Tweet graphic, waiting for the show to start, I can’t help but wonder: Is this the first time we’ve ever seen side eye on a major fight poster? Is it working for anyone else as much as it’s working for me? 2. These packages get slicker with every event. The Invicta production team’s learning curve is seriously impressive. 3. I’m not entirely sure why a promotion like Invicta needs ring girls, but I think the Invicta-branded leggings that they wore to the weigh ins are a nice compromise between a hint of titillation (midriff and cleavage!) and acknowledgement that models are not the main event. Vidal comes out swinging and has Ladd on the ground within seconds thanks to a flawless judo throw. The BJJ vet’s grappling is beautiful, easily slipping from half guard to rear mount, but Ladd fights her way into her guard just as quickly and manages to keep her to a stalemate there until Referee Mike Bell stands them up. They’re back down almost immediately and the fight settles into a battle between Vidal’s BJJ and Ladd’s vicious strikes. The latter gains the advantage as Vidal tries to turtle. Ladd secures the rear mount, lands a series of devastating strikes and Bell calls the fight at 4:21 of the first round. Vidal immediately argues that she wasn’t done, but Bell tells her that she wasn’t defending herself, and he’s right. In the post-match interview, Ladd completely no-sells her opponent’s submission attempts. Referee Mike Beltran has taken his beard grooming to the next level. Stanley almost scores a knockout with a series of strong right hands in the first 30 seconds, but Salazar (who took this match on very little notice) stays alert enough to work a series of single leg and double leg takedowns and attempts that buy her some time, but a knee from Stanley puts a stop to that. Salazar survives an impressive series of blows—so many that the usually combat-loving announcer and matchmaker Julie Kedzie starts hoping that she won’t have to take to many more, but the cumulative effect is too much. The Beard calls the fight at 2:59 of the first round. Cyborg has arrived. If there was any remaining doubt about the return of the nineties, just take a look at the outfit that Cyborg wore to the venue. That jacket makes me want to listen to Bell Biv Devoe. 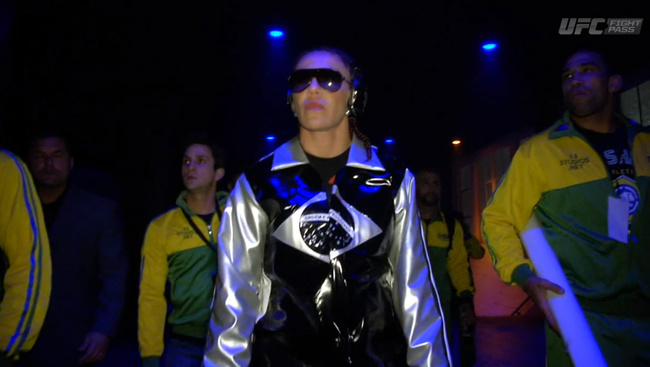 Then we see some footage from the open workout eariler this week with Charmaine Tweet and Cyborg. This package is a little less slick than the opening one, but worth it for the training footage and the one Cyborg fans who freaks out like a twelve year old at a Beatles concert when she sees her idol. “These ladies have a symphony going on here,” Kedzie exclaims in the middle of the third round of this intensely close fight and there’s really no better way to describe it. Round one is an exhausting battle in which the only break from pummeling against the cage comes when Van Buren scores takedowns and Montenegro quickly returns to her feet. Round 2 is a dead heat between Van Buren’s wrestling—particularly a surprising series of fireman’s carry attempts—and Montenegro’s devastating knees from the clinch until Van Buren finally gets the takedown and almost catches Montenegro in an armbar before she escapes and ends the round on top. 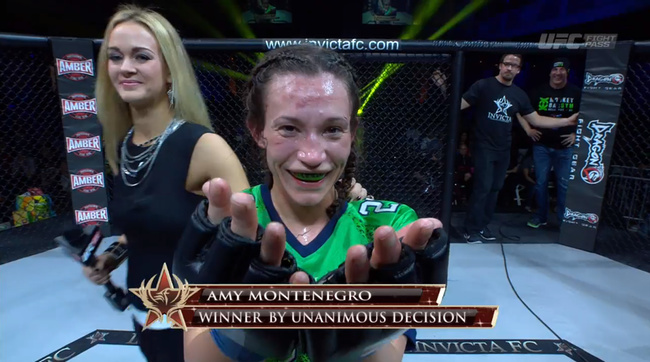 Montenegro’s dominance really starts to assert itself in the third round, though, which, despite an impressive kimura attempt and sweep on Van Buren’s part, solidifies her dominance both against the cage and on the ground. Montenegro wins by unanimous decision. We get another Grasso package. Moyle takes Aldrich to the ground within seconds. Aldrich manages to defend herself by holding Moyle in half guard until Moyle takes the back and traps her opponent in the rear naked choke. Aldrich fights it off as long as she can, but Moyle sinks the choke even deeper until Aldrich is out. Herb Dean calls the fight at 2:20 of the first round. We get a Colleen Schneider video package. Apparently she’s into Magic: The Gathering. She also took this fight against Irene Aldana on two weeks’ notice. Then we get another Cyborg package. And a Cyborg interview. She’s excited to be back because her life is MMA and she’s happy to be back in Invicta to defend her belt. She expects this fight to be like her other fights. She will make a good fight for all of her fans and her family. 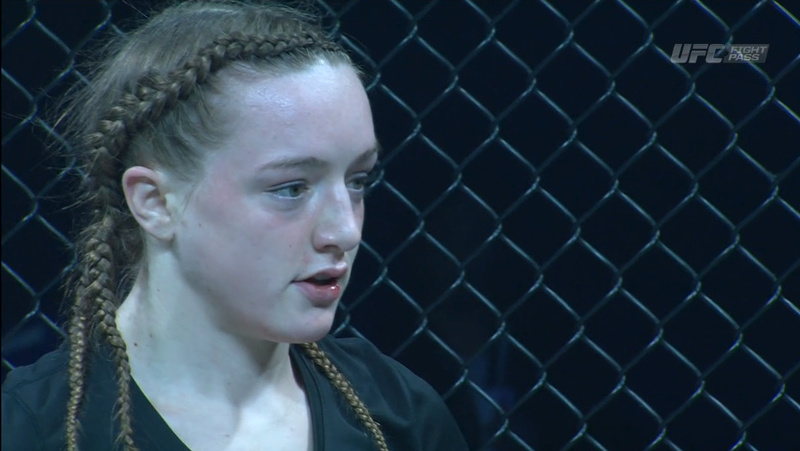 I couldn’t quite make it out with her accent, but I think she said that she wants to kill her opponent when she gets in the cage. Then we get a Charmaine Tweet interview. Her plan is to “alleviate the pressure,” and get away from the brunt of Cyborg’s offense. She seems pretty chill. But she is Canadian, and we’re really good at pretending to be calm and sweet at our most raging assoholic, so who knows? And now we’re watching the entirety of the weigh ins. All of these first round finishes have really screwed with the event’s running time. Instead of this, they should just interview that ref about his epic beard. The weigh ins video is over and we’re still waiting. Seriously, Mike Beltran is probably just hanging out, waiting to do his job right now and he’d probably be thrilled to talk about the upping of his beard game. Why is no one asking him about it for our viewing pleasure? In the opening package, Tweet talks about her issues with calling Justino “Cyborg” because she’s not a robot; she’s a human. And this feels a little bit like when I got mad at my cousin and refused to spell her name with a capital letter. As Schneider walks to the cage, announcer TJ DeSantis mentions that Schneider trains with Josh Barnett, so that whole Magic: The Gathering thing makes more sense now. Also, Mike Beltran and his beard are reffing this fight. There’s a lot of nerd power in this cage. 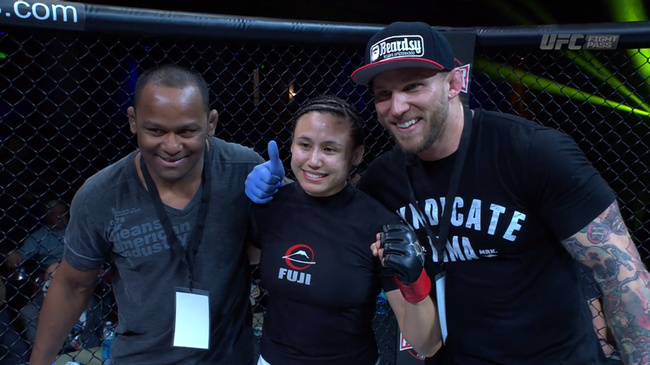 As for the actual fight, clear crowd favorite Aldana controls the direction and pace of the fight early with strikes, Schneider falters and Aldana takes control of the ensuing scramble by jumping to the standing rear mount and slapping on the rear naked choke. 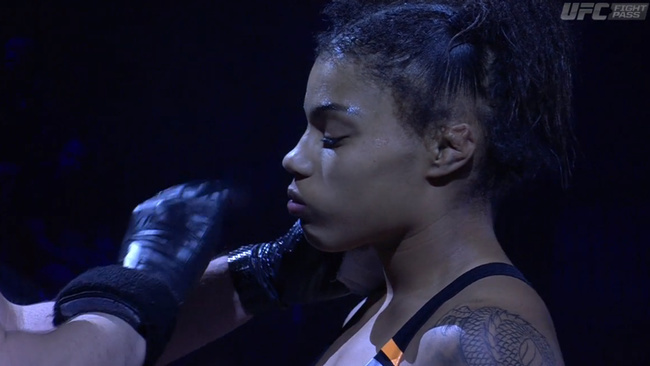 Schneider tries to defend herself, but drops to the ground and taps soon after, making Aldana the winner by submission at 1:05 in the first round. 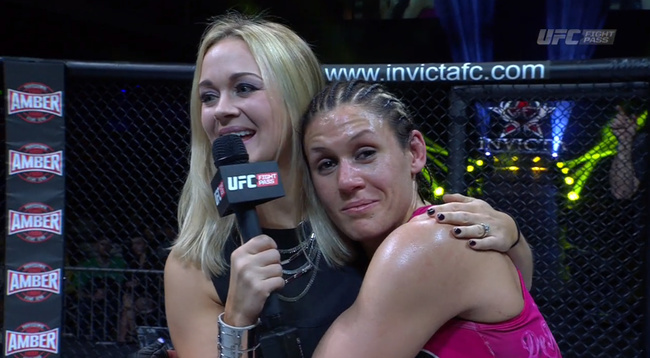 If Bennett’s last match against Jennifer Maia at Invicta 10 was a war, then this is a chess match. Round one is all about the two fighters sizing each other up in the middle of the cage before Bennett sinks in the underhooks and drives them to the cage where they grind and trade knees for the rest of the round. Round two begins and continues much the same way, with another grueling trade against the cage. Center becomes more aggressive in the third round, and even attempts some Diaz-esue grandstanding (with about as much right to said cockiness as Diaz has had lately), but it’s too little too late. Much like her previous knees and flurries, not quite enough to sway the judges. Bennett wins by unanimous decision, and remains undefeated at 7-0. Kedzie has just pointed out that they’re not using ring girls tonight. This is an interesting development. DeSantis speculates that this might be the fight of the weekend. It sounds like typical promotional hype, but the fighters quickly work to prove him right, with a fast and furious trade of combos. 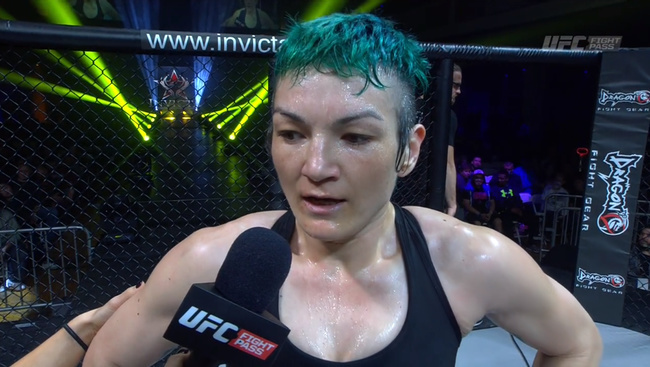 Inoue is fast, technical and aggressive, and arguably dominates in terms of cage control early on, but she’s simply no match for the speed and precision of Grasso’s striking, or that spinning back kick to the face. By the three minute mark of the first round, Inoue’s lead leg is visibly bruised by Grasso’s kicks and her face isn’t far behind. 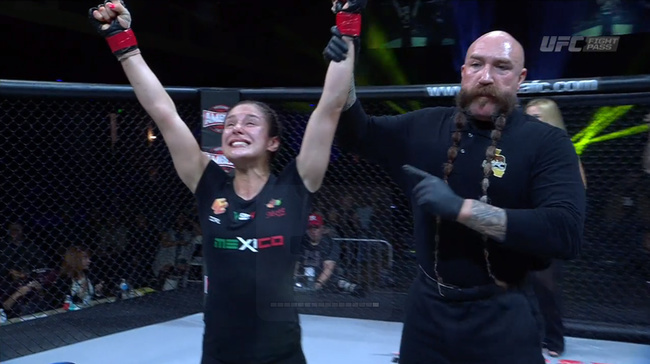 Inoue succeeds in a single leg takedown toward the end of the round, but Grasso is up faster than she’s down and responds with a series of knees against the cage. Round two sees another spinning back kick attempt, quickly followed by a high kick that hits its target. Grasso dominates a clinch, Inoue responds and scores another single leg, which Grasso quickly turns into an armbar attempt, which quickly turns into an inverse triangle, which even more quickly turns into an inverse triangle with a kimura attempt on the other arm, but Inoue holds on until the end of the round. Inoue manages a modicum of dominance in the middle of the third round, breaking up Grasso’s superior striking and innovative takedown defense with some control on the ground, and finishes the round in the mount, but it’s not nearly enough. Grasso wins by unanimous decision. Tweet’s Blue Steel game is really something. Cyborg launches forward with a series of wild haymakers, one of which downs Tweet and leaves her bleeding. Tweet scrambles and manages to defend herself just enough to stand up again, but Cyborg immediately connects with another series of shots and Herb Dean calls the fight at 0:46 of the first round. 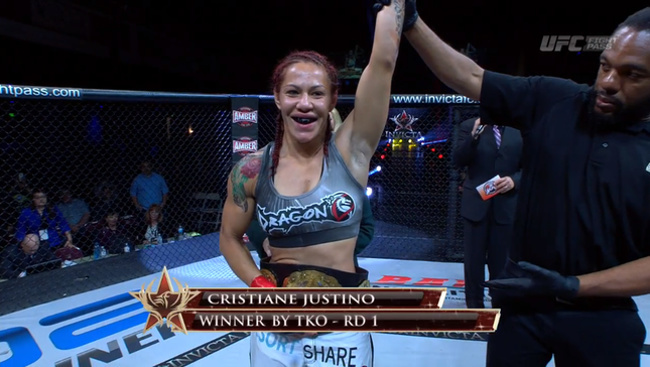 Tweet may have wanted to humanize Justino tonight, but Cyborg ended up looking just as monstrous as ever. After the fight, Cyborg gives a shout out to JC, says that she hopes to be in the UFC soon, and says she’ll try to make 135lbs. So here’s to another round of that speculation. In the immortal words of Jessie Spano: I’m so excited, I’m so excited. I’m so scared.